Made from a raspberry & white chocolate triple layered cake, smothered in a white chocolate & mascarpone frosting, this jelly bean illusion cake marks Only Crumbs Remain’s first anniversary. A year ago I tentatively and excitedly pressed the publish button and set Only Crumbs Remain live! It was nervous moment, wondering what was going to happen, but I can honestly say that I’ve LOVED the past twelve months in the blogging world! Not only have I been able to indulge in my passion for baking, I have also been privileged to work with a couple of great brands on collaborative posts, whilst also increasing my limited knowledge regarding photography and coding, amongst other things. Though small in the grand scheme of things, I feel like my blog & I have been on quite a journey during this past year. One of the best parts about blogging though is undoubtedly you, the reader. It’s wonderful to see people call by and read my recipe posts, and even more so when I hear that somebody has re-created a recipe, perhaps with their own twist. The support, lovely comments and friendships forged are very much valued. Wanting to mark my blogiversary with a cake, I decided to challenge myself and make an illusion cake (also referred to as gravity defying cake). I’ve often been impressed with illusion cakes, remember the one which Nadyia baked on GBBO last year, and wondered how on earth all of those delicious sweets were held in suspended animation. I imagined it required some form of complex assembly accompanied by a little hocus pocus, but how wrong was I! Thanks to You Tube, I soon realised that it is seriously straightforward and no magic spells were needed. Now illusion cakes often seem to be adorned with Maltesers or M&Ms, but wanting to use something colourful and cheery I decided to work with Jelly Beans! Not only are they vegetarian friendly, they’re so much fun too, you never really know which flavour you’re going to get! I used a mixture of regular shaped jelly beans and some heart shaped ones from Valentine’s Day. In hindsight I think I should have used some cigarellos or white chocolate fingers to create a fence around the cake, but I’m still more than happy with how well it turned out given that it is my first attempt at an illusion cake. The cake itself is a 3 layered raspberry and white chocolate sponge covered in a delicious white chocolate mascarpone frosting. Two layers were flavoured with a raspberry paste and coloured with a little Sugarflair paste. The colour I used was ‘peach’ which I admit is not ideal when hoping for it to carry a raspberry hue, but I simply worked with what I had available. These two layers sandwiched a delicious white chocolate sponge. This particular layer sadly sunk very slightly in the centre due to the weight of the melted chocolate, but this certainly didn’t affect the assembly nor the flavour. This was in fact my favourite layer. The three sponges were sandwiched with a thin layer of raspberry jam and frosting. The frosting was applied in two layers, being chilled after the first application to allow it to firm up. The frosting to the sides was then slightly patterned with a cake scraper. The illusion was then created with the use of drinking straws creating a support and melted white chocolate which was used as a glue. This You Tube Video provides a great tutorial for assembling an illusion cake. Time: hands on time around 90 minutes; plus 40 – 50 minutes bake time; cooling time. 2. Prepare the sandwich tins. Grease the base and side of two sandwich tins. Place a teaspoon of flour into one of the tins. Rock the tin around so that all of the greased surfaces are covered in flour. Knock the excess into the second tin and again distribute the flour in the same way. Tip out any excess flour. 3. Make the raspberry sponge. Place the softened butter and sugar into a good sized bowl. Beat together with a wooden spoon or electric beaters until very pale and fluffy. Gradually add the beaten egg a little at a time, beating well after each addition. Add the raspberry flavouring and beat again. Use a toothpick (or similar) to add a little of your chosen gel food colouring to the mixture. Beat again. Sieve the flour into the mixture. Using a spatula or large metal spoon fold this in gently. Add the yogurt and mix gently to combine. 4. Fill the two sandwich tins. Divide the mixture between the two prepared sandwich tins. You’re aiming for the tins to be half to two – thirds full. Use the back of a spoon or spatula to level out the mixture. Make a small hollow in the centre of the batter to encourage the cake to bake level rather than domed. 5. Bake. Place the two tins in the centre of the oven and bake for about 22 – 25 minutes. You may need to rotate the tins three quarters of the way through the bake. The cake is ready when an inserted skewer comes out clean. The cake will also pull away from the side of the tin slightly. Once baked, remove from the oven and place on a cooling tray. After 5 minutes carefully remove the cakes from their tins and allow to cool fully on the cooling tray. 6. Prepare a sandwich tin. Wash one of the used sandwich cake tins for the next sponge. Grease the base and side of the tin. Place a teaspoon of flour into the tin. Rock the tin around so that all of the greased surfaces are covered in flour. Tip out any excess flour. 7. Melt the white chocolate. Break the chocolate for the frosting and the sponge cake (totalling 420g) into smallish pieces and place in a bowl. Select a pan which allows the bowl to rest safely on the top of it. Pour a little water into the pan, about 5cm deep. Rest the bowl on the pan and ensure that its base doesn’t touch the water. Place the pan and suspended bowl over a medium heat on the hob. Once the chocolate has almost melted remove it from the heat and stir with a metal spoon or spatula. Set aside to cool for a 4 or 5 minutes. 8. Make the white chocolate sponge. Place the softened butter and sugar into a good sized bowl. Beat together with a wooden spoon or electric beaters until very pale and fluffy. Gradually add the beaten egg a little at a time, beating well after each addition. Add the vanilla extract and beat again to combine. Sieve the flour and salt into the mixture. Using a spatula or large metal spoon fold this in gently. Add 1.5 tablespoon of the cooled melted white chocolate and fold in until all of the ingredients are combined. 9. Fill the sandwich tin. Spoon the mixture into the prepared sandwich tin. You’re aiming for the tin to be half to two – thirds full. Use the back of a spoon or spatula to level out the mixture. Make a small hollow in the centre of the batter to encourage the cake to bake level rather than domed. 10. Bake. Place the tin in the centre of the oven and bake for about 22 – 25 minutes. You may need to rotate the tin three quarters of the way through the bake. The cake is ready when an inserted skewer comes out clean. The cake will also pull away from the side of the tin slightly. Once baked, remove from the oven and place on a cooling tray. After 5 minutes carefully remove the cake from its tin and allow to cool fully on the cooling tray. 11. Meanwhile make the frosting. Tip the mascarpone into a bowl. Use a metal spoon to briefly stir it to soften, avoid over stirring. Pour in the remaining cooled melted white chocolate. Mix the mascarpone mixture well. Cover and place in the fridge to firm up for about two hours. 12. Prepare to assemble. Place a tablespoon of raspberry jam into a bowl. Stir to loosen. Add a teaspoon of water and stir again. Remove the frosting from the fridge and briefly stir through to loosen. Fill a piping bag (no nozzle required) two-thirds with some of the frosting, (I find it easier to apply the frosting to the cake this way, though isn’t essential). 13. Start the assemble. Place one of the raspberry sponges on your chosen cake stand or plate. Spoon a little raspberry jam onto the cake’s upper surface. Spread it out. Pipe on (or use a pallet knife) some frosting. Use a pallet knife to spread it out. Place the white chocolate cake onto the prepared surface. Repeat with the jam and frosting layer to the white chocolate cake. Place the second raspberry cake on top. Try to ensure that the three stacked cakes aren’t leaning. 14. Apply the frosting. Pipe some of the frosting over the top of the cake and around the sides (or apply with a pallet knife). Use a pallet knife to spread the frosting all around the cake. Ensure that all of the surfaces have a nice thin layer of frosting. Place the cake into the fridge for half an hour to allow the frosting to firm up. Apply the remaining frosting to the top and sides of the cake either by piping it or with the pallet knife. Take your time to smooth out the frosting as best you can. Aim to get the side of the cake as smooth as you’re able if you’re not affixing any cigarillo (or similar). Either leave it this way or use a patterned cake scraper to apply a parallel pattern to the side, as I did. 15. Melt the white chocolate. In the same way as point 7, above, melt the white chocolate. 16. Build the illusion. Place the three straws into top of the cake, very close together, on a slight angle. Use a narrow piece of cellotape to secure the three exposed straw tips. Use a small brush (reserved for food use only) to apply a layer of melted white chocolate to the exposed straws. Decant the jelly beans into a bowl, remembering to retain one of the containers for the illusion. Paint a small amount of white chocolate to a jelly bean’s surface which will be in contact with the straw. Stick the bean to the base of the straw where it emerges from the cake, apply a small amount of pressure. Gradually add two or three more jelly beans around the base of the straw. Allow the white chocolate ‘glue’ to dry for a few minutes before building up the layers of sweet on the straw. Whilst those on the straw are drying, start to apply a few to the top of the cake. You may want to have some overflowing the side of the cake too. 17. Affix cigarellos or white chocolate fingers (optional). Consider standing a line of cigarellos (or similar) to the sides of the cake. Simply apply a small amount of pressure to affix them to the frosting. 18. Complete the illusion. Place a clean tissue or tissue paper into the jelly bean container. Position the container in the illusion so that the straws sit inside the sweet container. a) Avoid overfilling the sandwich cake tins. Should you have any sponge batter remaining, consider using it to make a muffin sized cupcake and bake it for about 20 minutes. If you have room in the oven you could bake it at the same time as the cake layers. b) Avoid using too much jam and frosting between the cake layers as this could result in them slipping. c) Don’t be concerned if the first layer of frosting shows a few cake crumbles, these will be hidden once the second layer of frosting is applied. d) Consider the angle which will create a ‘natural’ looking illusion. Place the straws into the cake at this angle. e) Stand back from the cake periodically to try to judge how ‘realistic’ the illusion of pouring sweets look, considering where more sweet need to be positioned. f) Take your time in building up the layers of sweets, allowing them to dry before adding more (this only takes a couple of minutes). g) The tissue inside the jelly bean container will help you to position it on a more effective angle. Thank you Choclette 🙂 I've learnt so much this past year, it's been quite a steep learning curve, but so much fun at the same time. I think the cake is relatively straightforward if it's made one step at a time, it's the first one I've tried and although I can see faults (like the application of the frosting) I'm more than happy with it and I know where I can improve in my next attempt….yes, there will be another attempt. I would use the silicon baking trays for vanilla cakes with lots of butter cream! I would use the cupcake cases to make cakes for a party! I'd make some cupcake shaped cookies with the cutter. I think me & my little girl would have great fun decorating them. Served with some lovely custard or are you an ice cream girl? I think the first thing I'd use would be the cupcake cases, cupcakes are always popular in our house! I would make some lovely iced cup cakes with Easter eggs on. Thanks you Rosemary, the cheese tart sounds good, we've just tried a Wensleydale one. A pack of 10 "Baked by…" gift tags with red ribbons attached. Love the idea of these, I'd bake Brownies and use them to give to my friends. A lemon tart with the flan tins – lack of a suitable tin is the only reason I haven't made one yet! I'd just make some basic cup cakes and use the icing bags to try and perfect my not so good piping! Ooh scrummy! I wish my hubby liked coconut! I would use the cupcake cases to make some cupcakes for easter. I would then ice them using the piping bag! The flan tins, I have Autumn apples int he freezer to use up so would make some little apple tartlets before getting started on some cakes/cupcakes. I would use the party cake stencils first. I've always wanted to try these and I think they would look really cute! I'd use my pretty blue bowl! I don't know how exactly, but it seems like the logical place to start. I'd like the cup cake cases so I could make some for Easter. What an absolutely fab bundle, thank you so much for the chance 🙂 I love that cake, it looks fabulous! I would use the patterned cake scrapers first, to create a posh effect on my mum's birthday cake and make it look fancier than I usually manage! I'd use the mini bundt mould to make some fabulous bundt cakes! The cup cake cases as I love cup cakes and will be making some in the hole. Happy 1st Birthday – I have just found your blog. Wonderful prize – I bake cakes most weeks so would find all the giveaways useful. 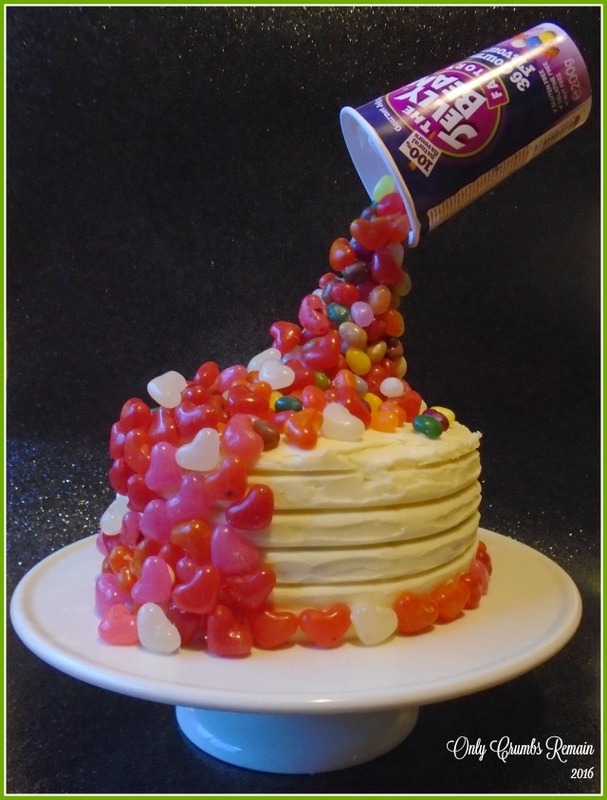 I love the jelly bean illusion cake and will definitely be attempting this. I love the idea of your Illusion Cake, think I would give that a go for my daughter's birthday that is coming up really soon! The stencils would make life a little easier too as I'm not the neatest at piping! The stencils would be great to decorate a flat surface. Ooh do send me a tweet of an image of your daughter's birthday cake if you give the jelly bean illusion cake a go. Happy birthday to her. The cupcake cases as I so love cupcakes!! I love my little cake tester, they're so useful. The cupcake cases certainly seem to be popular Lynsey, fingers crossed Postman Pat will get the parcel to you in time if you're the lucky winner. Thank you Helen 🙂 What a lovely idea, they'll look great with a flowery decoration to the top. Happy 1st birthday a great blog with great ideas I would love to try the nozzle to fill cup cakes with a flavoured butter cream or jam into jam buns . Aw thank you Tracey, that's really lovely of you. They sound as though they'll be delicious with a hidden treat in their centre. I'd use the flan tins to make a gluten free quiche! They sound as though they'll be lovely Lauren, gluten fee pastry isn't something I've tried yet. I would probably use the disposable icing bags first as I am rubbish at creating my own from paper and never seem to get washable ones to clean up properly. I would use items 4 and 5 as I recently disposed of my old icing bag and nozzles. The children and I will make a couple of cakes this Easter so we would use the items to decorate what we make. Sounds like you have a fun baking session planned. Thank you Helen 🙂 It's the first one I've made so I was so pleased that the actual illusion was straightforward. Are there other ways of constructing them? I would use the flan case to make a strawberry flan – I've been craving a slice for a while! Ooh yum, fresh berry strawberry tart! What a great idea, I should definitely practice too. I use the cupcake shaped cookie cutter to make biscuits for my lovely wee neighbour who's been unwell. Aw that's lovely Julie, I hope your neighbour is feeling better soon. I would use the cupcake cookie cutter to make cinnamon biscuits. My daughter loves stamping out the shapes and decorating them after. I find the cake skewer such a useful piece of equipment when I'm baking sponges. I'd use the cake tester as I plan on making a chocolate cake soon that I'll be shaping into a hedgehog for a friends birthday! I would use the labels and make some nice biscuits with my daughter to give as gifts. Oh my gosh this is a work of art! I don't think I could eat it! So talented ? I'd make some carrot cake cupcakes! I would use the cupcake cases and icing bags first, because if my kids saw this set I would be begged into baking lots !! Happy Bloggiversary !!! It's amazingly simple isn't it, I too imagined that it'd be beyond my cake decorating abilities. You'll have to have a go at it when you get chance. Love your cake Angela – I do like anti gravity ones. I would make a flan – as I haven't made one in years! Aw thank you Louise. Anti gravity cakes are a lot of fun aren't they. Been meaning to try out one of these vertical pouring cakes, they look such fun! Thanks for joining in with #BAKEoftheWEEK ! The cupcake shaped cookie cutter when baking cranberry and white chocolate chip cookies. P.S. your cake is really fab!! Thank you Jenny, I had great fun in assembling the illusion. I'd try the blue plate out first. This looks gorgeous, Ive always wanted to try a cake like this but really don't think I have the patience! Happy blog anniversary!! Thank you Midgie, I think if you're organised it's not too demanding plus if you use slightly larger sweets like the maltesers, which are often used, you probably wouldn't need to 'glue' quite so many on making the whole process a tad quicker. Aw thank you Rebecca 🙂 It's lovely to hear that I've inspired you to try different things through my little blog 🙂 Sending early happy birthday wishes to your young lady. I would use the flan tins first to make a delicious flan for the family – lovely giveaway! This cake is absolutely amazing! Pinned 🙂 I also joined in the give-away, love the post! Happy Blogiversary!!! Thank you Mandy, they're actually surprisingly straightforward to make Mandy, just needs a little patience whilst attaching the sweets. the cupcake cases for some easter treats! I find icing bags so useful. The party cake stencils as my daughter's first birthday is coming up soon! Happy Blogiversary! I would try the stencils first I think! Thank you 🙂 The stencil pack looks to have some great designs in it. I would use the stencil on a birthday cake for my son. 3, Cupcakes. If I win would give prize to family friend who bakes for my Mum and family.As we like to show appreciation for his kind gesture. Whilst we know that it is his way to show appreciation towards my Mum and her family. We have known him for decades. Thank you Corina 🙂 Sounds a perfect plan there. I'm sure they would too – the pack has loads of great designs. The non-stick fluted flan tins as we have a freeze full of berrys from lat year. I would use the icing bags and practice my icing skills on a cake. Definately the cupcake shaped cake tin! 🙂 I love butterfly buns, I often made them with my mum when I was young. I'd use the stainless steel piping nozzle and i'd make homemade meringue nests! You know, nor have I. Great choice to make something savoury. I would use the pack of 100 pretty paper cupcake cases in five red & pink designs to make some fairy cakes. I would uses the tins to make bakewell tarts! You can't beat a good cupcake can you, a little bake all to yourself. Happy blog birthday! The flan tins wold be my first used item! Happy 1st Blogging Birthday – Have only been on Twitter for 8 months and really love the Food Blogging Sites & hopefully will be setting up my own shortly. The Gravity Defying Cake is amazing- Well done & here to many more years blogging and making people more interested in Baking & cooking!! Aw thank you Wendy 🙂 The food blogging community is so friendly and supportive, you must let me know when you launch your site and I'll certainly pop over. Happy Bloggy Birthday. Your cake is amazing, nice change from the maltesers! I would use the gift tags first. Thank you Shaheen, ah I wonder what goodies you'll make to attach the gift tags to. I would use the six hole silicone mini bundt mould to try and make Mini vanilla Bundt Cakes.